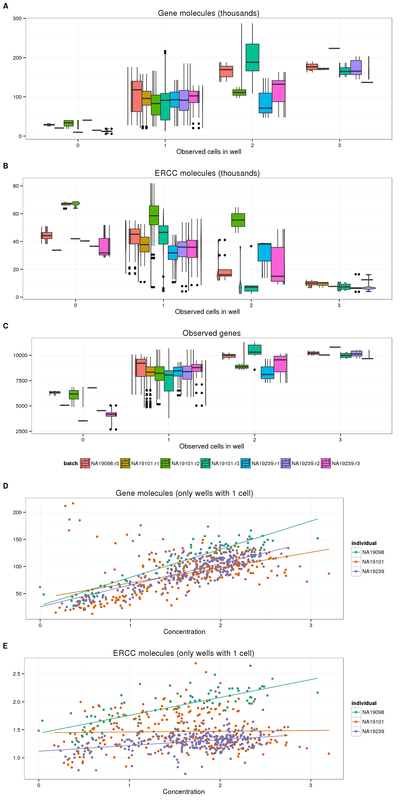 Can we infer cellular mRNA content from single cell RNA sequencing data? Start with the annotation file. It contains the bulk samples as well, so remove them. Import the read counts per gene. 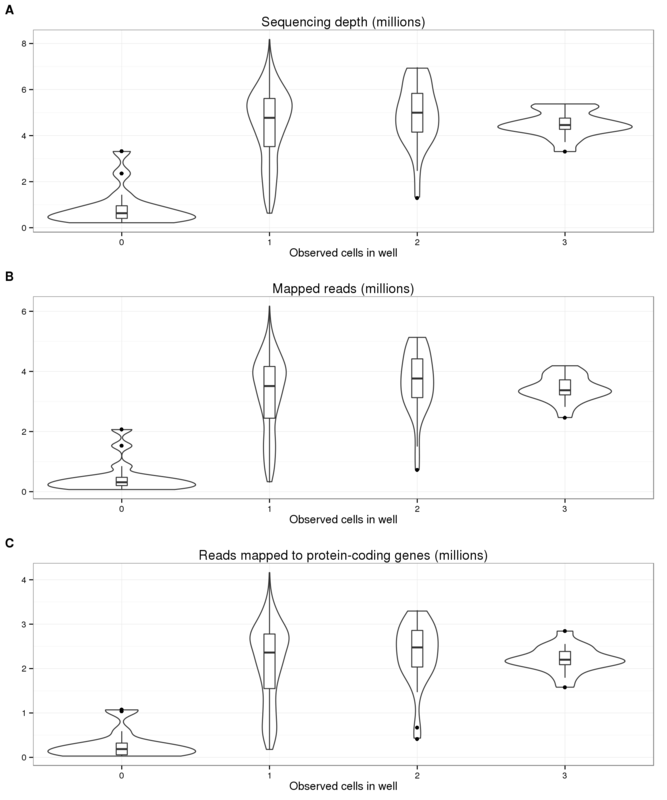 Per cell calculate the total number of reads that map to endogenous protein-coding genes, the total number of reads that map to ERCC spike-ins, and the total number of reads that map to both. Import the molecule counts per gene. Per cell calculate the total number of molecules that map to endogenous protein-coding genes, the total number of molecules that map to ERCC spike-ins, and the total number of molecules that map to both. Import the summary counts from featureCounts. These were gather from the featureCounts summary files with gather-summary-counts.py. The data come from the sickle-trimmed sequences combined across all lanes for each single cell. Calculate the total number of mapped reads, unmapped reads, and sequencing depth (mapped + unmapped reads). Calculate percentage of ERCC reads (out of all reads assigned to a feature), ERCC molecules, and unmapped reads. Calculate capture efficiency, here defined as the percentage of input ERCC molecules that were observed. This data set has not been subjected to the expression level filter, thus it includes 85 ERCC spike-ins. As we try to understand the general relationships between sequencing results and cellular mRNA content, we remove outlier batches. The quantification of the concentration of the single cells in replicate 1 of NA19098 failed. The number of ERCC molecules in replicate 2 of NA19098 are abnormally high. Because there were so few wells that contained 4 or 5 cells, we remove these first. Using data from sequencing reads, i.e. not utitlizing UMI information, we observe no correlation between the number of sequences and the number of cells in a well. On the other hand, utilizing the UMIs, we do see a correlation with the number of molecules per well with the number of cells per well (panel A below). Crucially, in accoradance with our expecations, this trend is not present in the ERCC molecules (panel B). 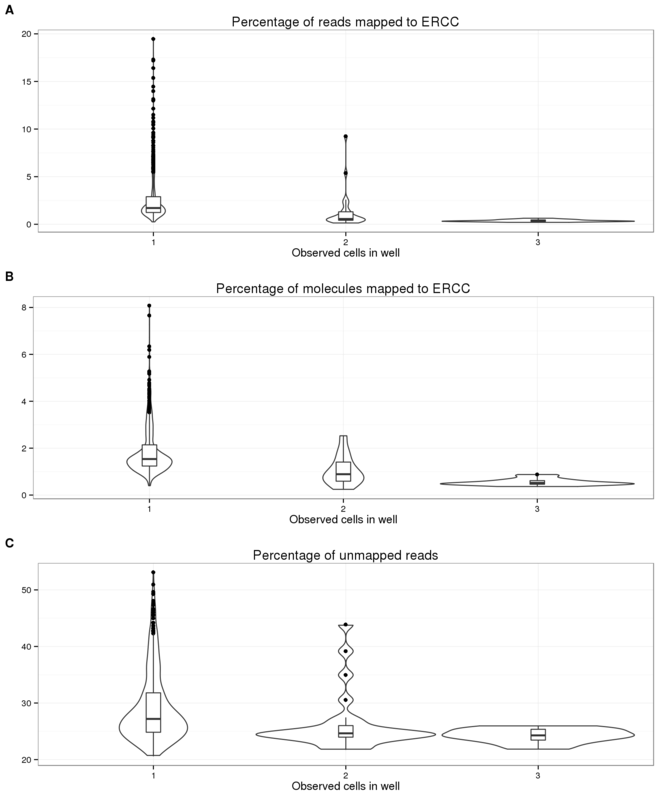 In fact, we observe the opposite trend, which makes sense since the ERCC spike-in molecules are a smaller percentage of the total molecules in wells with more than one cell. Furthermore, the increasing trend is also observed with the number of observed genes (panel C). 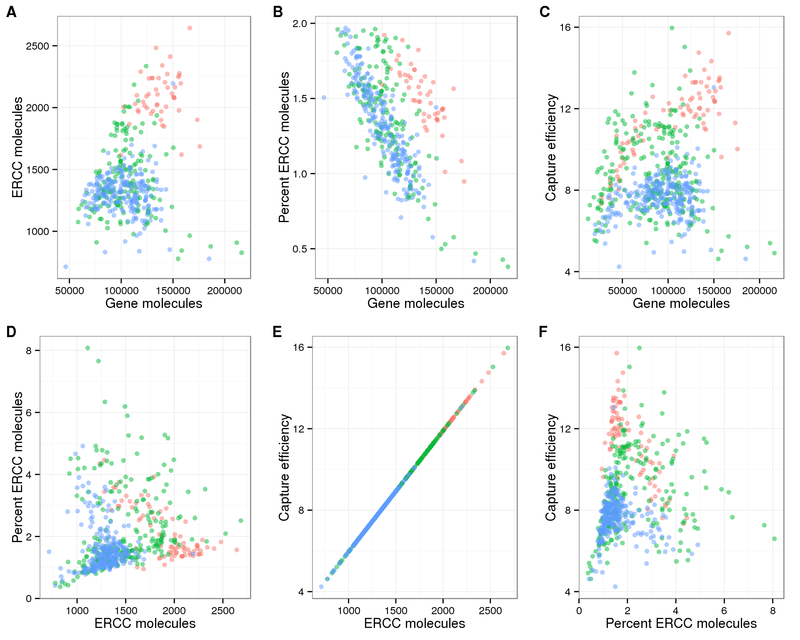 Because of the observed increase in the number of gene molecules and decrease in number of ERCC molecules with increasing cell number, it is reasonable to expect that the percentage of ERCC molecules is a proxy for cellular mRNA content. We do observe this expected trend with the ERCC molecules (panel B below), and to a lesser extent with the ERCC reads (panel A). Since the ERCC percentage is also used as a quality control measure, we wanted to confirm that the observed trend was not simply due to quality issues. The percentage of unmapped reads, another quality measure, does decrease from one cell to two cells, but does not change much from 2 cells to 3 cells (panel C). 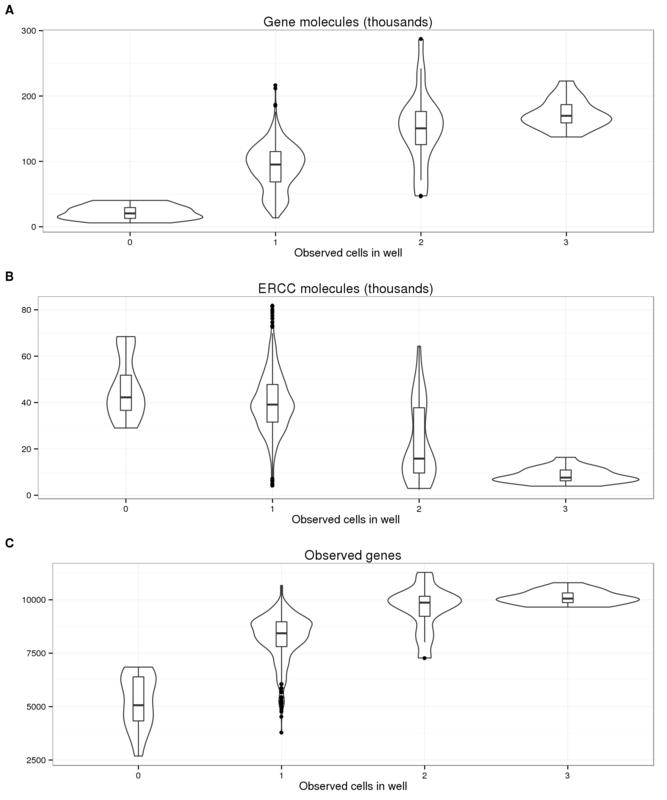 Since the wells with zero cells have much higher percent ERCC and percent unmapped (because they are bad quality), we removed them from the plots below to better observe the relationship with cell number. Now for the confusing part. We also have the concentration of each well after it was amplified in the C1 chip, but before undergoing library prepration. If this is an accurate measurement, we expect concentration to increase with the number of cells and also correlate with the total number of gene molecules. We do observe the latter (panel A below), but not the former (panel B). More specifically, for wells that contain one cell, we observe an increase in the number of gene molecules with an increase in concentration (panel C). However, the concentration decreases with increasing number of cells per well (panel B). We also observe a correlation with the number of gene reads and the concentration (panel D). 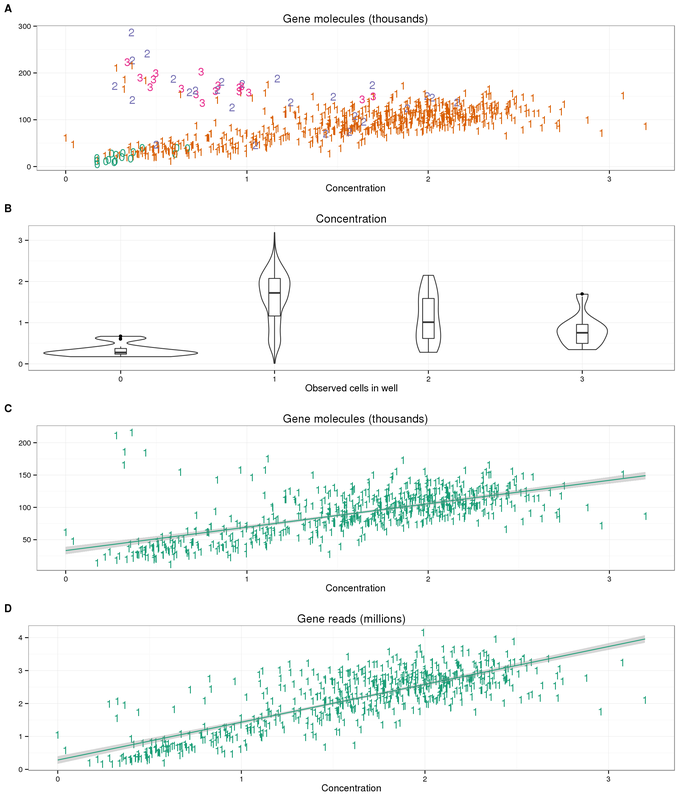 Thus the post-amplification concentration influences the amount of gene reads that are ultimately sequenced, but this concentration does not necessarily correspond to the original amount of mRNA in the cell. We also see some wells with one cell that cluster with the multi-cell wells. These may be errors in the cell counting. Further complicating the interpretation is the variability both within and between batches. While there are clear differences in the mean of the distributions of many of these metrics across wells with differing cell numbers, the variability is really high. Do we expect that some single cells will have the same celluar mRNA content as a well with 2-3 cells? Do we expect the cellular mRNA content from a single cell to vary this much? For wells with a single cell observed, the first quartile for the total number of gene molecules is 68619, and the third quartile is 115044.5. (Note: I purposely avoided using the minimum and maximum here since the minimum value is likely from one dead cell, and the maximum is potentially from a well with multiple cells). The variability between batches are even more difficult to interpret. Strangley, the three individuals are consistently different across their three replicates, suggesting these differences come from the actual cells and not the single cell processing. But how well can they be used for these three purposes? The plots below display the mutliple ERCC metrics for wells that contained only one cell. For the purpose of quality control, it is difficult to oberve a clear distinction between high and low quality cells using the percent ERCC molecules, as the percentage ERCC molecules continuously decreases with increasing gene molecules (panel B above). For the purpose of measuing cell-cell technical variability, we observe clear differences between the three different individuals (all panels above). However, the replicates of the individuals are consistent. Thus this cannot be arising simply from the PCR amplification, library prepration, and sequencing. Something inherent to the distribution of gene expression in the single cells from these three individuals is consistently affecting the molecule counts. 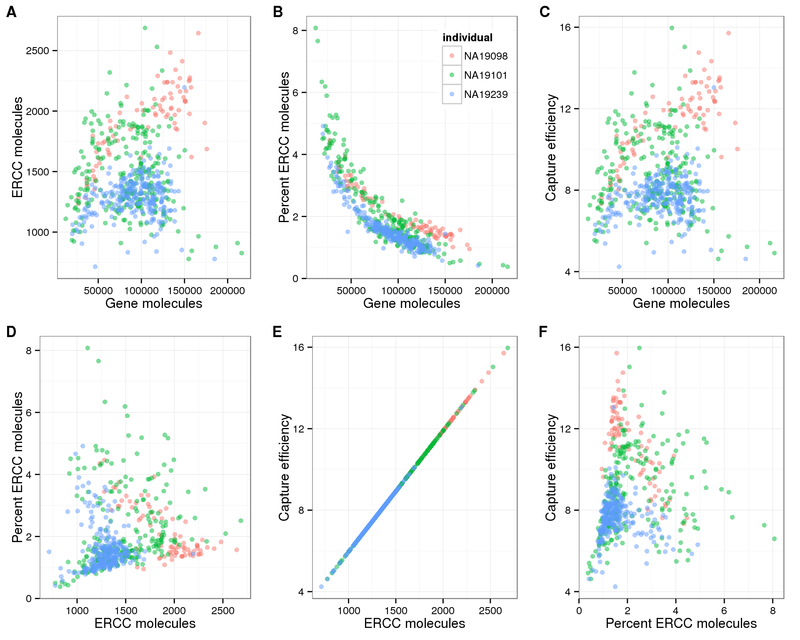 For the purpose of measuring cellular mRNA content, there is clearly a relationship between the percent ERCC molecules and the total gene molecules (panel B above; also see plots above showing decrease in percent ERCC molecules with increasing cell number). But the confidence in the accuracy of this estimate is decreased based on the above two points. If we choose a cutoff of percent ERCC molecules less than 2% (arbitrary but reasonable based on the density of the points), a large amout of the variation in the percent ERCC molecules is removed (panel B below). But maybe this is a good thing since we do not expect that much variation in cellular mRNA content in a group of homegenous cells? And it further highlights the differences between individuals. Here is the same plot as above, but only inclduding cells with percent ERCC molecules less than 2%.